I woke up on Day 364 to the sound of productivity in the living area of Grouper Therapy. Like the seasoned professionals they are, my mom and her friend Ellen had come over early to gather all of the various things they'd brought over to the house for the dinner party and to clean the house as well as they would've if they were cleaning their own. I may have been a day away from turning 30, but my mom was still treating me like a child, certain that I wouldn't have done as good of a job as she did with the sorting and the cleaning. Under any other circumstances, I would've been bothered by the fact that she sometimes finds me completely incapable. On this particular day, however, I was just fine with it. We had to check out of the house by noon so that the real cleaning crew could come in and get the house ready for the next guests. I did my part, carrying things from one side of the room to the next and overall keeping my personal cleaning crew entertained with stories from the night before that happened after they left. After all the furniture had been returned to its correct spot, the beds were stripped, and I'd packed all of the luggage I'd brought (and there was a lot), I gave an appreciative head nod to Grouper Therapy, thanking it for allowing me to make many memories there, and crossing my fingers that we hadn't done any permanent damage to the place. After dropping the key off at the realty company, I headed downtown with Lauren to meet a group for lunch. After we ate and shared many a laughs (again), I said good-bye to my mom and Mark and Jen, and then per her request, I took Lauren on a mini-tour of downtown Charles ton. 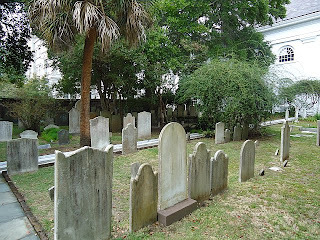 If you've talked to me for an hour, or read this blog at all, you know I've had a love affair with Charleston that has been going on for quite a while; yet for some reason, I always get nervous sharing it with people who have never been there, fearing that I may have oversold it. What if the person I'm showing it to isn't that impressed and they feel like they have to fake interest just to spare my feelings? Awkward. Luckily, Lauren seemed sincerely impressed by my favorite city as I walked her through Waterfront Park and then down to the Battery. It was a beautiful day. Hot, but beautiful. As we made our way back to Market Street, we saw a group of tourists take a right into a grave site with historical markers and we followed them. 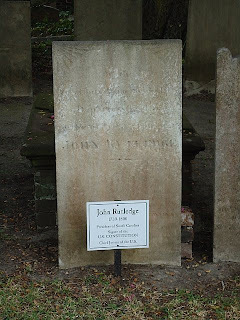 As we roamed through the grave markers, I laughed thinking about my friend Jen, who used to tell anyone getting bent out of shape about their birthday, "Well if you weren't getting older, then it would mean you're dead." 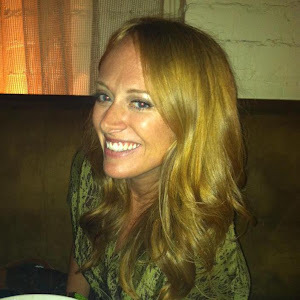 She was right - there are far worse things than being 30. Being dead is just one of them. While walking through the Charleston market, where we ran into Amanda and Stephen, we stopped for a drink and then I drove Lauren to the airport. I hugged her tightly goodbye and then drove away, my destination unknow n.
I considered jumping on the interstate and heading back to Atlanta, but for some reason, I just wasn't ready to go. I just couldn't leave the beach. So I just drove around the city, by the house that I used to live in and by the health club where I used to work. 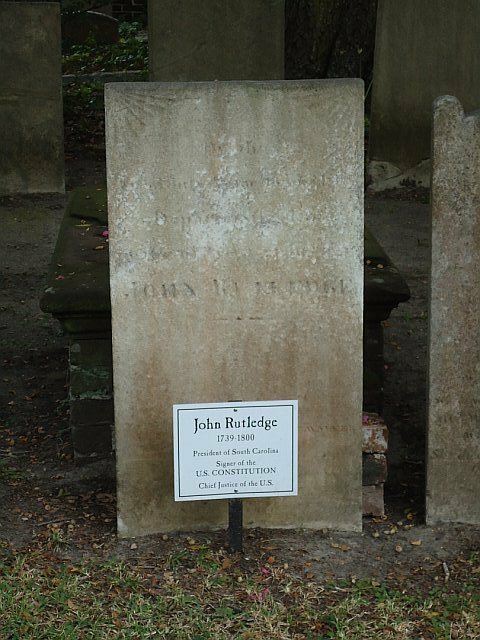 Finally alone with my own thoughts for the first time in three days, I realized I still hadn't done anything I'd never done before (besides see John Rutledge's grave), and I panicked. Really, Stephanie? One day to go and nothing planned? Ahead of the birthday trip to Folly Beach, an old friend from college, now a Charleston resident, reached out to me and suggested that I paint the Folly Beach Boat as something I'd never done before. 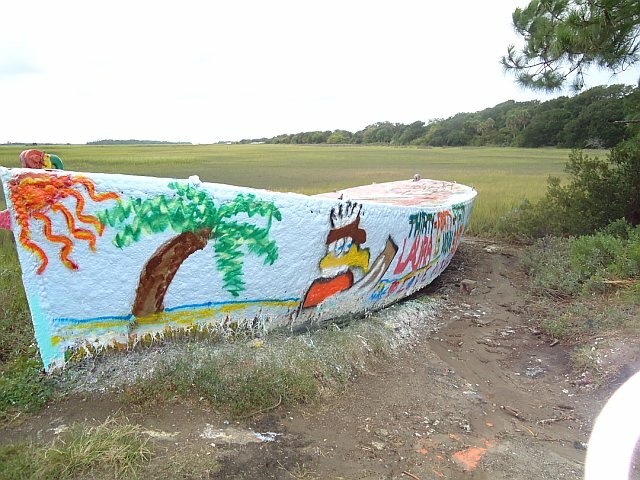 The Folly Beach Boat is an abandoned boat that washed ashore after Hurricane Hugo in 1989. No one ever claimed the boat, so it stayed, right there on the side of the road. 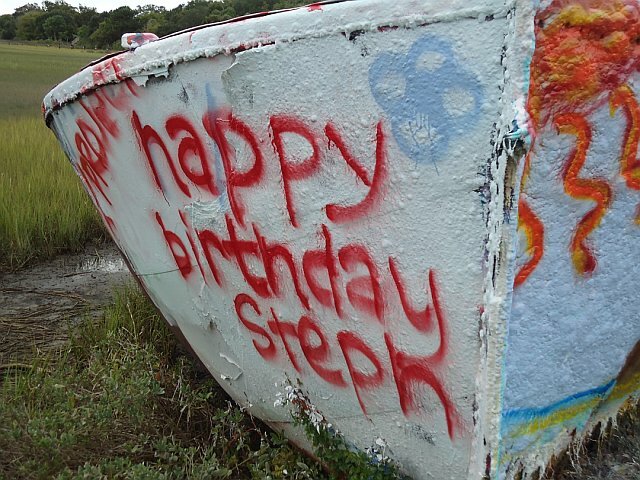 A year after the hurricane, someone painted a message on the boat and ever since, others have followed suit, leaving behind birthday and anniversary messages for their friends and family. I've driven past the boat hundreds of times on my way out to the beach, and I absolutely loved the idea. Unfortunately, as we all know, planning and executing are not my strong suits. I never really put forth any effort to get the Birthday Party Crew in on this, and since we were very busy with the responsibilities of the weekend like eating and drinking and relaxing, I never got around to it. By the time I remembered the great idea, in my car panicking, everyone was already on their way back home. I took a few deep breaths and tried to channel the brave girl who started this insane task back on September 27, 2009, and I drove to Wal-Mart, picked up two cans of spray paint, and went back to the boat, by myself, to make Day 364's thing I've never done before to wish myself a happy birthday on the Folly Beach Boat. On the way over to the boat with my two cans of spray paint, I started thinking, a little too deeply, about what a full circle moment this would be to paint a message to myself. I was brainstorming ideas of clever sayings to put on the boat, and coming up with some pretty awesome rhymes. I was really excited. Only when I got there, I saw that some woman named Laura's friends had already been there, writing "Thirty-Forty-Fifty, Laura is now Sixty. We Love our Old Bird." My rhymes were way better than that, but their mural was quite colorful and there was a picture of a bird next to it, as well as the words, "Love U Nana." 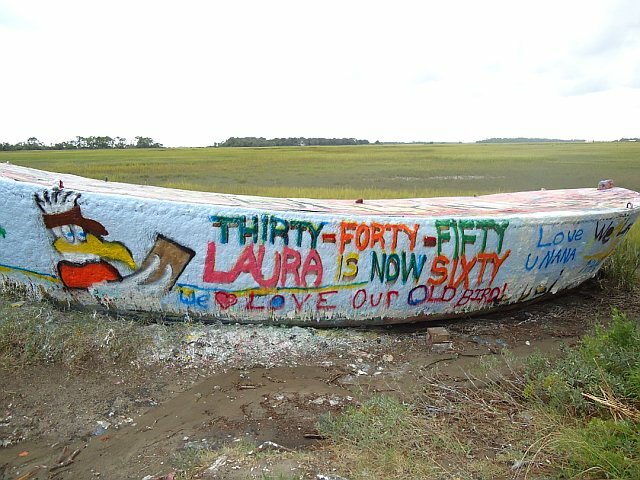 There are no rules about how long messages have to be left on the Folly Boat before someone else can come and paint over it, so if I wanted to ruin Laura's message with my own, I could have. 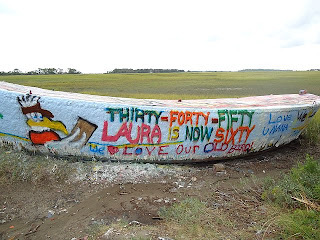 But whoever painted the message to Laura had taken a lot of time to do it, and I just couldn't justify ruining their artwork with my two cheap cans of spray paint. Plus, when I reread the words, "Thirty-Forty-Fifty," somehow turning 30 didn't seem so monumental anymore. I stood there for a minute, cars whizzing by me, unsure of what to do next. Then, without really thinking, I walked around to the back of the boat, to an area that's hardly visible to anyone driving by; I popped the lid off the red spray paint can, and painted, simply, "Happy Birthday Steph." A birthday wish to myself. I grabbed the light blue can and painted a little lame flower next to my happy birthday message, and then I got in my car and I drove away, unsure if anyone would ever see the message. Indeed, it became a full circle moment. When I started writing this blog, I called it, "my birthday present to myself." For me, it was an opportunity to challenge myself and do things that I'd never done and get back into writing like I'd always wanted to. I'd hoped, but wasn't at all confident, that anyone would ever read it. Taking that risk, exposing myself has further solidified what I already knew: the best things in life aren't things. In fact, the best presents are sometimes the ones that challenge us to think about our lives in a different way; the ones that demand us to recognize the wonderful people we've invited to share our journey, and the ones that force us to see the beauty that's all around us. This project did that. I would leave my twenties humbled by the many blessings in my life, and eager for the next chapter, whatever it might hold. There are days when this "present" to myself felt more like a curse. But I know now what I'm capable of, and it's far greater, so much sweeter, than I could've imagined. That's the real payoff. The fact that so many others connected to my words, or were amused by them or inspired by them has been more than I could've ever hoped for. I'd like to think though, that like the private birthday message I wrote on the Folly Beach Boat that day, that even if I knew no one would ever see it, I would've written it anyway. Sometimes the best gifts are the ones we give ourselves. You are indeed a HUGE inspiration! And I found a place that does hang gliding...let me know if you fancy a trip to Chattanooga!